The relative positions of station to goods shed are similar to those at Berkhamsted and Kings Langley, but neither fit the rest of the picture. This looks like Wilmslow. If so, the train is on the line to Manchester via Stockport, the platforms on the right being on the Stockport avoiding line via Styal. Under a powerful glass the name on the lamp is about the right length, the final letter is almost certainly W and has what could well be an M in the middle, which would seem to confirm Wilmslow. If anybody confirms my ident of of this station as Wilmslow, the date will be after May 1909 when the Styal line opened to passengers. Ronnie Gee was relief station supervisor at Wilmslow, and is quite certain this is Wilmslow by reason of some small details which I was told but cannot remember. One thing about that photo which interests me is the train in the distance. It is too unclear to be certain but it does not look like an LNWR engine. So I wonder if it is a North Staffordshire Railway engine. I know they used to work along that line, having reached it via Sandbach. Can some one tell us anything about the workings? In response to Ted's comments, I don't believe that the NSR ever worked through Wilmslow, although they did have powers or arrangements to run over large parts of the LNWR in the area between Birmingham and Manchester. In the WTTs for 1905-11 there are no NS trains booked over the Manchester main line south of Cheadle Hulme. They ran their own passenger service from Macclesfield in London Road, and also goods trains on the same route to and from Edgeley Junction, Longsight and London Road. Of course, this does not preclude NS trains being booked over the route after WW1, nor indeed the use of an ex-NS engine in LMS service. 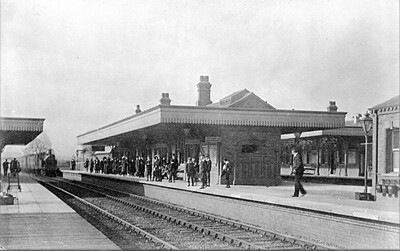 On the other hand, although the photo is undated, it does have a pre-WW1 "feel" to it, and may be not long after the rebuilding of the station in 1909. However, the same WTTs of 1905-11 show a couple of GWR goods services each way from Gresty Lane to Ordsall Lane via Wilmslow and Heaton Norris. This came as a surprise to me, as I had previously believed that the GWR ran to Manchester London Road only via Warrington and the L&M route. This may not be relevant, as it appears to be a passenger train in the picture. Also, by 1909 there was a L&YR service between Stockport and Colne via Denton, Droylsden and Victoria. Two of these daily were extended to and from Wilmslow, giving another possibility for a "foreign" engine been seen there.